When Steven asks me where or what I’d like to eat, my mind always pictures a combination of calamari, fresh salad and ouzo, but instead I answer something like ‘pasta would be fine‘, thinking Aberdeen has nothing like this to offer. sardines, as fresh as it can get, and so sweet! Choosing which seafood restaurant to choose has always been a struggle, mainly because all of them offer fresh food, however there is one I like the most. My family and I were invited to nibble the meze variety at Dionisis, a traditional seafood restaurant that has established its fame since 1956. It is located just in front the harbour so it is accessible if you drive (there is a car parking nearby), or if you fancy walking from the city centre. They pride themselves of cooking the most fresh fish and seafood, from the early morning hours, based on traditional recipes to accompany ouzo or tsipouro drinks. 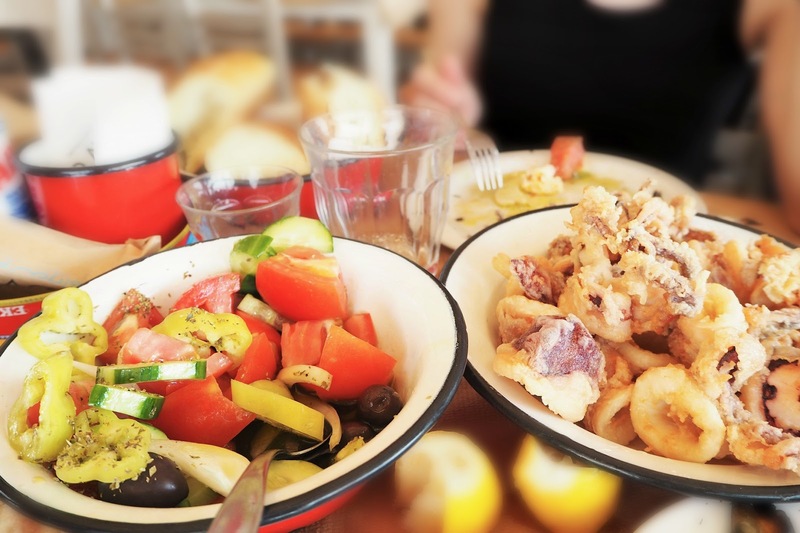 Here you can find fried squid, grilled octapus, sardines, crabs, lobsters (and the list goes on), along with fresh salads and Greek dips like tzatziki and taramosalata! We most certainly enjoyed our visit and my parents have already booked their table for next time they are in town. Have you ever tried tsipouro or ouzo? Next Post In London for 24 hours.